Polymers are one of the most fascinating materials of the present era finding their applications in almost every aspects of life. Polymers are either directly available in nature or are chemically synthesized and used depending upon the targeted applications.Advances in polymer science and the introduction of new polymers have resulted in the significant development of polymers with unique properties. Different kinds of polymers have been and will be one of the key in several applications in many of the advanced pharmaceutical research being carried out over the globe. This 4-partset of books contains precisely referenced chapters, emphasizing different kinds of polymers with basic fundamentals and practicality for application in diverse pharmaceutical technologies. 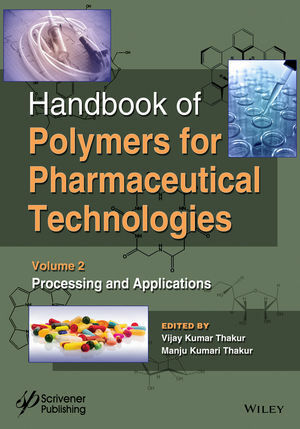 The volumes aim at explaining basics of polymers based materials from different resources and their chemistry along with practical applications which present a future direction in the pharmaceutical industry. Each volume offer deep insight into the subject being treated. Vijay Kumar Thakur (Ph.D.) is a Staff Scientist in the School of Mechanical and Materials Engineering at Washington State University, U.S.A. He has published more than 100 research articles, patents and conference proceedings in the field of polymers and materials science and has published ten books and 25 book chapters on the advanced state-of-the-art of polymers/ materials science. He has extensive expertise in the synthesis of polymers (natural/ synthetic), nano materials, nanocomposites, biocomposites, graft copolymers, high performance capacitors and electrochromic materials. Manju Kumari Thakur works in the Department of Chemistry, Himachal Pradesh University, Simla, India.